As a special education teacher, I used some scripted programs, such as Jolly Phonics, Read Naturally, and Edmark to help students progress and meet their academic goals. I also created my own activities to incorporate during small groups and in the classroom. When I pushed into the classroom, I would walk around and assist all students as needed, sit near my students and work with them one-on-one, or lead small group instruction; what I did depended on the grade level and subject. I communicated with the general classroom teacher when figuring out my role for the day as well as my observations. In addition to my teaching responsibility, I also made modifications and resources for the students to use while completing assignments as necessary. Here are examples of some of the programs and modifications I made while being a special education teacher. Click on the pictures and links to more clearly see the examples. I used Read Naturally with one of my students who needed to improve her reading fluency. The format of the program was helpful because she could hear the short story and practice it a few times between her cold and hot reads. She showed improvement in accuracy and words read after her hot read. If she still did not reach her goal, we would repeat the passage the next day. In addition to Read Naturally, I also created sight word flashcards for her to practice them; recognizing sight words also improves fluency since they are not possible to decode. I also used a basic Listening Comprehension activity with one of my students who had difficulty in this area. I would read simple directions, such as color the penguin’s feet orange, to see if she could accurately listen and follow the directions. Over time, this will transfer to answering simple questions about the characters and events in a story, so she could improve her listening and reading comprehension. Some of my students were below grade-level in math, so I created additional activities to review previous skills, such as basic addition, skip counting, and money, while working with them in small groups. I used manipulatives, such as coins, counters, hundreds grids, and small white boards, as often as possible to make learning visual and have the students engaged while practicing. I had students draw a visual representation when reviewing the complements of ten; using this visual made it easier for them to recognize the complements and apply to actual problems. I modified the second grade unit math test; while the content is the same, some of the problems are adapted to fit the ability levels of my students. I made sure the problems tested the secure unit skills, but I adapted the difficulty to focus on simple addition, subtraction, and complements of tens. As a result, I could assess that my students were making progress and meeting their academic goals. The picture to the left shows the modified test and click here to see the original test. 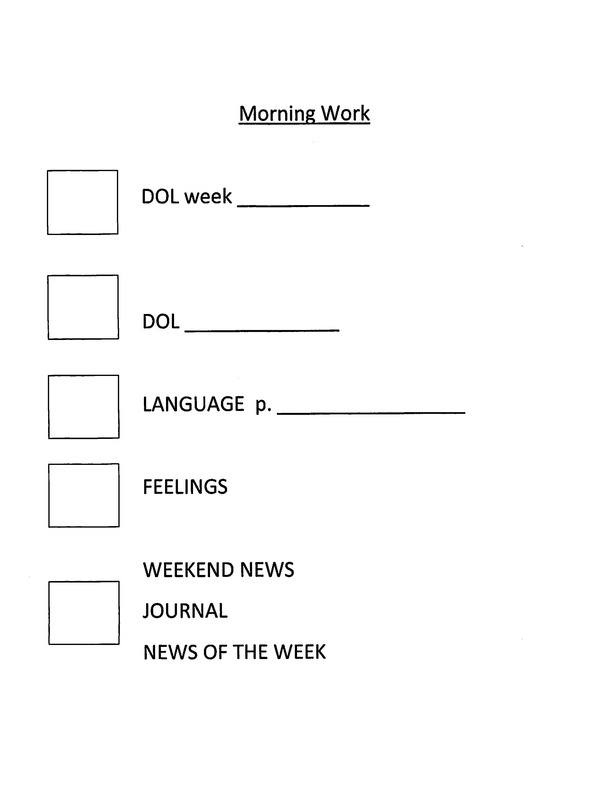 I created a morning routine checklist to help one student stay on task and complete his work. This sheet was placed in a sleeve, so the morning routine could be modified each day and he could check off after he completed an activity. This worked well because it kept the student on task and he enjoyed making a check mark after completing an assignment.